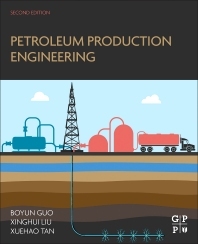 Petroleum Production Engineering, Second Edition, updates both the new and veteran engineer on how to employ day-to-day production fundamentals to solve real-world challenges with modern technology. Enhanced to include equations and references with today’s more complex systems, such as working with horizontal wells, workovers, and an entire new section of chapters dedicated to flow assurance, this go-to reference remains the most all-inclusive source for answering all upstream and midstream production issues. Completely updated with five sections covering the entire production spectrum, including well productivity, equipment and facilities, well stimulation and workover, artificial lift methods, and flow assurance, this updated edition continues to deliver the most practical applied production techniques, answers, and methods for today’s production engineer and manager. In addition, updated Excel spreadsheets that cover the most critical production equations from the book are included for download. Xinghui Liu is currently a Senior Completion Engineering Advisor with a major oil company, specializing in well completion and hydraulic fracturing design in shale and tight unconventional plays. He has over 30 years of work experience, and has previously worked for Halliburton, Pinnacle, RES, Indiana University and PetroChina. He possesses in-depth understanding of hydraulic fracture complexities and characteristics across different shale and tight oil/gas plays, and has provided fracture design and execution with a strong focus on post completion evaluation and optimization via integration of diagnostic technologies including microseismic, tiltmeter, and fiber optic DTS/DAS monitoring in many fields worldwide. He earned several degrees in Petroleum Engineering, including a BS from Daqing Petroleum Institute, an MS from Montana Tech, and a PhD from the University of Oklahoma. He has authored and co-authored numerous technical papers on a variety of subjects including fracture design and optimization, fracture monitoring, fracture performance evaluation, geochemical modeling, acidizing, formation damage control, gravel packing, and Non-Darcy flow analysis. Xuehao Tan is currently a Senior Modeling and Simulation Engineer specializing on acidizing modeling, temperature simulation in the wellbore and reservoir, applications of coiled tubing and acid fracturing. Previously, he worked for Texas A&M University as a Research Assistant in their Petroleum Engineering department. Xuehao earned a BE in Engineering Mechanics from Tsinghua University, a MS and PhD both in Petroleum Engineering and both from Texas A&M University. He is active in SPE and serves as technical reviewers for several journals related to production engineering. He has published many SPE papers on temperature simulation, acidizing modeling and related topics. Xuehao was awarded the Faculty Award of Excellence from Texas A&M University in 2013.